Wi-Fi networks have many variables and points of frustration. Different types of walls, materials and objects can impact the Wi-Fi signal in varying ways. Visualizing how the signals move about the area is difficult without the right tools. A simple Wi-Fi stumbler is great for quickly checking signal levels, but a map-based surveying tool helps you visualize the coverage, interference and performance much more easily. They allow you to load your floor plan map, walk the building to take measurements and then give you heatmaps of the signals and other data. 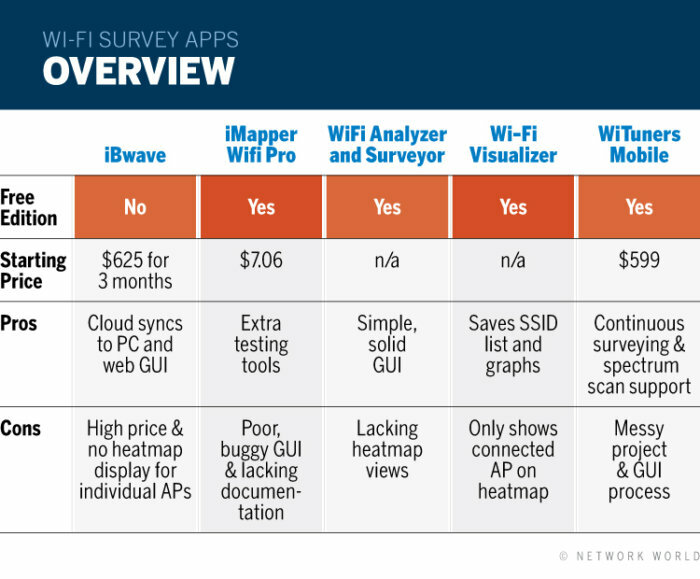 In this review we look at five mobile survey apps: iBwave Wi-Fi Mobile, iMapper WiFi Pro, WiFi Analyzer and Surveyor from ManageEngine, Wi-Fi Visualizer from ITO Akihiro, and WiTuners Mobile.They range from free/cheap options for surveying small office networks to those with an enterprise price tag designed to handle larger networks. Prices are listed in US$. We found pros and cons in all the apps we reviewed. Paying the hefty enterprise-level price does get you many more features, such as spectrum scanning and cloud syncing; if you're surveying larger networks they're definitely the way to go. But as you’ll see, they aren’t perfect either. 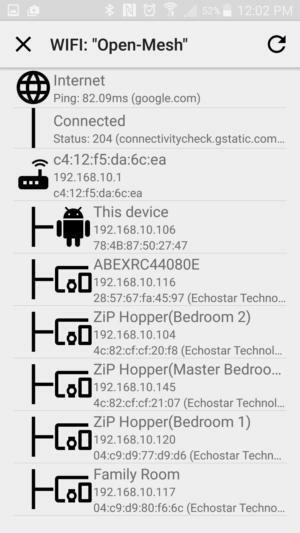 The free and cheap apps can provide basic surveying functionality for small and simple networks, plus other Wi-Fi tools that can be useful. Targeted at the enterprise market, the iBwave Wi-Fi Mobile app carries the highest price tag we’ve seen for an Android-based survey app. We like its intuitive app design and GUI, as well as its cloud-syncing ability and compatible PC viewer app, but were disappointed it couldn’t display survey heatmaps for individual APs. The iMapper WiFi app has some unique features and tools, especially the automated test plans, but it’s certainly not a polished product. There seem to be some bugs, the GUI is flakey and its documentation and support are almost non-existent. This app might be okay to use for simple surveys in homes and small businesses, but we don’t recommend it for professional use in larger surveys. We found a solid app and GUI when evaluating the WiFi Analyzer and Surveyor from ManageEngine. However, the map-based surveying capabilities are quite limited, making it appropriate for only the smallest and simplest Wi-Fi networks. We did find the analyzer features to be pretty useful, however, with intuitive and attractive graphs. And the product is completely free. Wi-Fi Visualizer is the simplest surveying app we reviewed. Unfortunately, it only captures the signal levels of the AP you’re currently connected to. For a freebie app, we did think the network map was a nice bonus and were impressed with the ability to save the SSID list and graphs on the stumbler side. This could be a free useful tool to utilize in addition to others. The WiTuners Mobile app is also targeted towards the enterprise market. It provides some neat features, such as continuous surveying to remotely monitor the Wi-Fi, rogue AP detection and tracking, and support for a spectrum analyzer. However, the app GUI and project processes could certainly be fleshed out to be more user-friendly and intuitive, and it is the only one of the five that only works on Android tablets. It would be great if the app were phone-friendly. The iBwave Wi-Fi Mobile app is basically a lite version of the company's Windows PC edition. Like its other solutions, this app syncs its data to the cloud, giving you a convenient way to share projects and move between the mobile and PC editions of the software. Furthermore, the free iBwave Viewer lets your customers and other third-parties view the survey data and generate their own reports. Pricing for the iBwave Wi-Fi Mobile app starts at $625 for a 3-month subscription, $1,250 for a 12-month subscription, or $2,680 for a perpetual license. This pricing is certainly the highest of the Android-based Wi-Fi surveying apps we’ve ever reviewed. However, if you only need it for a short period of time, iBwave can be worth the money. We evaluated version 8.1.1.134 of the iBwave Wi-Fi Mobile app. When you start a new project, you can select a floor plan picture, take a photo of a printed drawing, or create one on the device. Selecting a picture and taking a photo is straightforward, but the in-app drawing tools lacks pre-set shapes and objects. We wouldn’t think many users would manually create a floor plan in the app, but if they did, having to draw it using a freehand pen would make it really difficult to create a usable floor plan. Once you've imported or created a floor plan image, you must set the dimensions to ensure the map is to scale. You can optionally add defined zones for RF density and capacity if you plan to use its prediction functionalities, including simulating the coverage of access points without performing an actual survey and collecting data. At first it wasn’t quite clear how to apply these zones on the floor plan. The process turned out to be pretty intuitive, but it would have been nice if there were a little in-app help or tips along the way. You can perform passive or active surveying with the iBwave app. You can conveniently utilize the iBwave Viewer PC app as the server for the active surveying. You can optionally add pushpins to the floor plans and save multiple photos, videos, audio, or text notes to that location. You can also use the mark-up feature to draw free-hand on the floor plan. When viewing the heatmaps, you can display them for the signal, throughput (if an active survey was performed), signal-to-noise ratio (using your defined noise level), overlap zones, co-channel interface and capacity. You can select to display the heatmap for the desired band, SSID or channel. However, it doesn’t allow you to easily select a particular AP to see just its heatmaps, which is unfortunate if you want to view individual coverages. Nevertheless, you can easily export the survey data file or upload to iBwave's cloud service to view the data and generate reports in their other products, including the iBwave Viewer PC app. The iBwave Wi-Fi Mobile app also comes with a stumbler feature called the Scan Tool. You can perform auto and manual scans for both bands or individual ones. In addition to the usual passive scanning, you can do active throughput tests, which also can test against the server built into the iBwave Viewer PC app. For passive scanning you can input advanced settings, such as the RSSI offset, receiver sensitivity and manually defined noise level for each band. However, the Scan Tool doesn’t show the security status of the APs, which would be nice for auditing reasons. The iBwave app is worth buying for the surveying needs of large or enterprise networks. Though some features could be improved, it seems like a solid app and its integration into the iBwave solutions seems convenient. iMapper WiFi is developed by Fullsunning Inc. It offers a free edition with limited functionality, such as being able to only save two projects, and a full edition that costs only $7.06 from the Google Play store. In addition to the typical heatmap survey functionality, it does provide several other Wi-Fi testing tools. But as you shall see, you get what you pay for. We evaluated version 2.2 of iMapper WiFi app. When creating a new project, you can select a floor plan image or take a photo of a printed floor plan. The process is straightforward, but you can only have one floor plan image per project, which means surveying a multi-floor network requires you to set up multiple projects. Additionally, the odd scaling process (you have to adjust a circle around the image) wasn’t apparent until we discovered how to do it from Fullsunning's website. It would have been much better if there were some sort of tip in the app to describe the process. The default survey view displays the signal levels of the currently connected AP. You can also choose from five other views. The Channel Analysis view can show the recommended channel with the lowest signals, channel with the strongest signal and channel rating of the currently connected AP. The Network Name (SSID) and AP Device (MAC) views allow you to filter the heatmap to the signals of either the SSID or AP you choose, whereas some of the other tools only allow you to select one. The Link Quality view shows you a heatmap of the level of data rates, from bad to good. All the heatmap views showed useful details, but it would be nice if a quick description were given in the app to clarify the data that’s shown. Unfortunately, there isn’t any way to export or save the heatmaps or collected data beyond saving screen shots. Furthermore, it seemed the app had some bug where the floor plan map would occasionally move, so the survey paths and data points weren’t aligned anymore with the locations where they were taken until we restarted the app. From the main menu, you can bring up the Analyzer page. It shows a typical channel usage graph and AP details for one or both bands at the same time, a signal-over-time graph and a signal meter for the currently connected AP, and a channel analysis chart. All these views look great and are useful. It can even give you the noise and signal-to-noise ratio if you connect an external analyzer. From the main menu, you can also access the Tester page. This gives you some tools to test Wi-Fi association times, ping times, HTTP response times and throughput via FTP upload or download. You can run these individually or create an automated test plan to run multiple tests. On the top of the app, you’ll also find a shortcut to the sniffer tool. It shows you the connection details of your currently connected AP. Among the basic details you can find elsewhere, it also includes the WLAN MAC address of both the Android device you’re using and the AP you’re connected to. If you have an external analyzer connected, it can also display the raw data packets seen over Wi-Fi. We wouldn’t suggest using this app for surveying larger business-level networks, but it could be useful in home or small office environments, and its extra testing tools might be interesting. The WiFi Analyzer and Surveyor app from ManageEngine offers very basic surveying functionality. There is no premium edition offered, just the free app. We evaluated version 2.10. When you open the app, you’re given the option to go the Analyzer or Surveyor page. On the Surveyor page, you can easily add a floor plan from your device’s storage or Dropbox, or add its example plan to just play around. Though it doesn’t allow you to take a photo of a printed map directly within the app like the other apps reviewed, you can take a photo with your device and then select that image within the app. When surveying, you long-tap your location instead of short-tapping like in the other apps. Initially you see tips pop-up to describe the process, which we thought useful. When you end the survey, you’re shown the report. However, as with iBwave you can’t select a single AP to see its particular coverage; you can only select an SSID. You can switch between the heatmap and signal strength views in the survey report, which look very similar. The signal strength view shows a defined dot of each location you tapped with the corresponding color based upon the signal level, whereas the other view shows the color in a larger area with the heatmap effect. However, the heatmap effect is only slightly radiated beyond the size of the dots you see in the other view, so you just basically see blurred dots where you long-tapped (captured the signal) on the map. Just about all other survey tools use prediction to fill those gaps and create more of a full heatmap without having to walk every square-foot of a building. On the Analyzer page of the app you'll find four different views. The Channel view shows a typical channel usage and signal bar graph along with a list of the AP details. The Interference and Signal views provide a similar graph but are designed to give you just those details. We like that you can select the APs to show on these views based upon the signal level (best, good, weak or all), but it would be nice to view the graphs for both bands at once instead of having to flip between them. Then the Wi-Fi Details view shows you a nice text-based list of the APs, but it lacks the particular security method used. In the Analyzer settings, we liked that you can set a scan interval or disable scanning, which can be useful if you just need a one-time reading or manual readings. Additionally, you can give APs an alias name to help you track them or choose not to show them. These simple settings can help on the networks you continually monitor. This app wasn’t created with full-scale surveys of large networks in mind, so we'd only use for smaller networks or portions of a larger network. The free Wi-Fi Visualizer app from ITO Akihiro provides a very simple heatmap surveying functionality along with a couple other Wi-Fi tools. We evaluated version 0.0.8 of the app. After opening Wi-Fi Visualizer, you see the Scan screen, which displays details of any current Wi-Fi connection. Alongside the IP details and basic wireless statuses, it also shows the channel width and center channel -- both welcome additions. You can also page through the tabs to see a nice channel and signal graph of the 2.4GHz band and each subset of the 5GHz band, but it would have been nice to have at least all the 5GHz band on one page. There’s also a tab for the SSID List on the Scan screen. You can’t filter the list, and sorting is limited to just SSID and BSSID. However, you can save a snapshot of the SSID list and the graphs to come back and view later. This is a convenient feature not all other free apps offer. On the Heatmap screen, you can name and create a new project. Once you add the floor plan, a simple quick tap logs the data point. It saves both the signal and link speed of the connection. Unfortunately, unlike the other survey apps, it only logs the stats for the AP you’re currently connected to. This can be a problem if you want to see whether signals from one AP are interfering with another's on the heatmap; it’s just not possible. There’s also no export feature in the app, but you can do a manual screenshot or come back later to view the saved heatmap. On the Network Map screen, you can view a tree of the devices detected on the network. It’s basically a simple IP scanner. It shows the IP and MAC addresses and network names of the infrastructure components, like the router, in addition to the client devices. This is a nice bonus feature not seen in most other Wi-Fi survey apps. You can even click on a device to open the web browser to its IP address in case there’s some sort of web-based GUI. 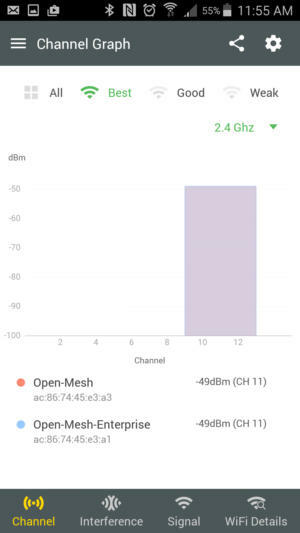 On the Chart of Signal Strength screen, you can view a signal graph over time for the AP you’re connected to. You can adjust the amount of time shown. Though very simple, we also liked how it had a static line indicating the typical border line of roaming at -80 dBm. Even if you require a better surveying tool, this app still might be worth adding to your toolbox for its network map view and ability to save network lists. WiTuners Mobile is WiTuner’s main on-site surveying tool; we evaluated version 5.0.5. The company offers two flavors of WiTuners Mobile: A free version that limits you to saving just five survey data collection points, and a $599 version that has no survey data limits and includes lifetime support. In addition to passive surveying, the app can also perform active surveys using iPerf or ping. Furthermore, the paid version can be set to do continuous data collection, which lets you watch the charts remotely in real-time with WiTuners Planner. After opening the app, you’re shown right away the details for the nearby APs and can optionally connect to the desired AP within the app. This seems useful, but we were caught off guard at first because most surveying tools don’t pop-up with a network list right away. After that you’re taken to the main survey screen with a row of menu icons up top. A quick tip then pops up describing how to access the main system menu (by long-tapping the screen). That's a good thing, because otherwise that would never have occurred to us. The pop-up tip also says you can touch and drag APs to their locations. This is because the app automatically places the APs onto the blank workspace. But since we hadn't even added a floor plan map yet, this feature felt a bit messy, like the app was getting ahead of itself. It’s a neat feature, but it would be nice if it were an on-demand function you could optionally utilize later. After poking around the app for a couple minutes, we found what seemed like a lot of neat features, but it was still unclear how to start a project. Turns out there is no defined project creation process or even any way to save projects. This confused us in the beginning, especially because the survey data disappears after exiting the app. However, WiTuners Mobile does automatically back up the survey data, and you can restore the data in order to resume a survey. You can also sync the data to the cloud and use it in WiTuners' other products, or import floor plans from the cloud, but it would still be nice to have a typical project-based file system in the app. When surveying, you must double tap a location to collect the data, whereas most other survey apps require just a single-tap or long-tap. A double-tap is a little odd and could potentially be problematic if you don’t tap in the same place both times. We liked how you can add notes, photos and other media to the map, but at first it wasn’t apparent how to add these things to a specific location. You can filter survey results based upon the Wi-Fi band, SSID, and rogue or non-rogue APs. Like two of the other survey apps, you cannot easily show just a single AP. When viewing the heatmaps in the app, we noticed there is only the signal-based heatmap. However, the PDF report the app generates does provide additional heatmaps for overall Wi-Fi quality and SNR. Additionally, it includes a channel utilization graph and tables of the raw survey data. From the eye icon, you can access a menu of other screens to view a summary of nearby APs, list of nearby APs, channel utilization graphs and a rogue AP list. We feel the WiTunner’s app is trustworthy enough for use in business environments, but we're unsure about using it for larger networks.